Fall is harvest season, and with over 280 wineries in the state one doesn't need to travel far to have their cup overfloweth. Nine wine festivals run throughout the state from October to November. Celebrate Virginia Wine Month in October with festivals in Norfolk, Ashburn, Chincoteague, Powhatan, and more. Wine festivals are one of Virginia's oldest and strongest traditions: You should have no trouble finding one in any part of the state. Virginia offers almost as many cider (fermented apple juice) celebrations as wine, and has as many variations, too. Visit any of the numerous cider farms throughout the state in preparation for Cider Week. According to the official Virginia state website, "the week-long celebration will feature special tastings, pairings, dinners, events, and workshops." Fall never tasted better. An autumn staple, Virginian children love pumpkin picking. With plenty of farms scattered across the Commonwealth, one should have no trouble locating a prime destination. Back Home on the Farm in Harrisonburg is a personal favorite, but, as long as they've got pumpkins, you can't go wrong. When you're done picking out your soon-to-be jack o'lantern, look up the closest apple harvest and butter festival near you. Pick your own apples, ripe for the season, and stay for the corn maze, great food, and, of course, choice ciders. Great for a family outing or a fun fall date. Speaking of corn mazes, Virginia boasts some of the best in the country. Whether you live in northern, central, or southern Virginia, corn mazes are always nearby. Wind your way through the labyrinthine maze and stay late for Halloween activities, or come early to pick pumpkins and eat seasonal treats. Nothing screams fall like a corn maze. Take adventure of the cooler weather before the winter frost to enjoy the beautiful Virginia scenery. National parks are dotted throughout the state, each offering something unique. Climb McAfee Knob, the most photographed location on the Appalachian Trail, or take a quiet walk along the Potomac River. You can't go wrong. Virginians are lucky to have not one, but two great theme parks well with-in driving distance. Kings Dominion offers their annual Halloween Haunt, a special Halloween themed experience If you're in the market for Halloween thrills, it can't be beat. Busch Garden's Howl-o-Scream is sure to delight. Haunted houses, themed shows, and Halloween themed escape rooms make for a frightening good time. And, of course, there are roller coasters, too. In Virginia, a weekend doesn't go by without a fall festival. Many of the festivals, including Sinkland Farms' and Cox Farms', have been celebrating the season for well over 25 years. Highlights include pumpkin patches, hayrides, fields of fear, pumpkin chucking contests, bake offs, and live music. The Hampton Roads Grilled Cheese festival is only in its early stages of existence, but is already booming with popularity. Contests run all day, with prizes for Most Ridiculous, Most Cheesiest, Best Tomato Soup, Fan Favorite, and Grand Champ. Participants hand out samples that visitors will vote on to choose a Fan Favorite. Make sure to book your tickets early! Virginia Tech has one of the best college football teams in the nation, and a game is well worth the trip to Blacksburg. It's easy to get swept up in "Hookie" fever during football season, even for those who aren't generally interested in the sport. Imagine it: the roaring crowds, the talented cheerleaders, the overwhelming pride as the winning touchdown is scored… It's almost enough to make you want to go back to college yourself. 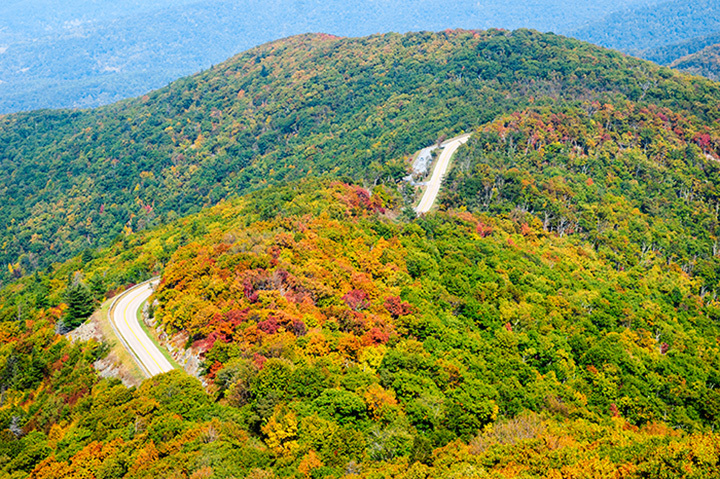 Take an afternoon detour through Skyline Drive to enjoy the splendor of the season. Watch as the leaves change colors seemingly before your eyes. Keep an eye out for deer, black bears, wild turkeys, and other animals that call Shenandoah home. The full trail is about three hours long, but with 75 overlooks offering stunning views, it will be three hours well spent. Virginia has a burgeoning film community, and once a year the city of Charlottesville, in partnership with the University of Virginia, hosts a film festival to celebrate upcoming filmmakers. Come for the films, but stay for the festivities, including special guests, family day, and the parties. Book tickets early for this November delight. Sandcastle aficionados from all over the world flock to Virginia Beach, Virginia in early October to show off their sandcastle building chops as part of the Neptune Festival. These structures aren't your typical sandcastles by any stretch of the imagination: you'll see creations that defy logic, that are alive with imagination. These "castles" deserve your attention. You won't be disappointed. Many Virginians still celebrate Virginia's checkered history as the capital of the Confederacy in the American Civil War. No matter your personal leanings, the many Civil War reenactments throughout the state can be educational, as well as entertaining. Virginia is home to many of the most significant historical events in the nation's history, including more Civil War battles than any other state. Witness battles as they would've been fought, ask questions of the participants, and experience camp life.